Do you know you are a brilliant artist? My Buddhist practice has taught me you are constantly creating your world with your words and actions, and even your thoughts. If you read that and think, "Yeah, that's great, but I'm afraid," I want you to know that shaking in your boots while taking baby steps toward a life you love also totally counts! As my graduation from Institute for Integrative Nutrition's Health Coach Training Program grows closer (it's tonight!) and as I build my coaching practice, I feel more and more conscious of- and grateful for- my magic markers. I graffiti doors onto brick walls. I turn periods into question marks. I create possibility. It's definitely a practice. Truthfully, I often catch myself whining about the way things are: "I have terrible periods," "I'm too spacey to drive," and "I hate exercising." But like a frustrated toddler in a restaurant, magic markers are just the thing to soothe my mood. Suddenly I'm empowered and create a world where "I am learning so much about how to have a happy menstrual cycle," "I'm at least as focused as most 16 year olds," and "I love to dance." 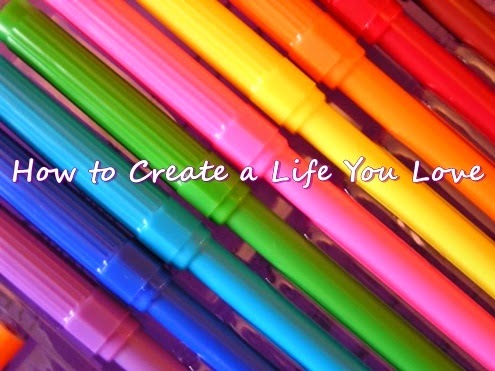 As you go through your week, I invite you to explore the power of your magic markers. Observe your thoughts, words, and actions. What kind of effects are you getting from them? Try using more empowered thoughts, words, and action and see what changes. Lemme know how it goes.